ConvertPlus, a WordPress popup plugin helps you create attractive popups, which can be used as sign up forms or opt-in forms. These forms are mainly used to attract website visitors and convert them into newsletter subscribers or customers. 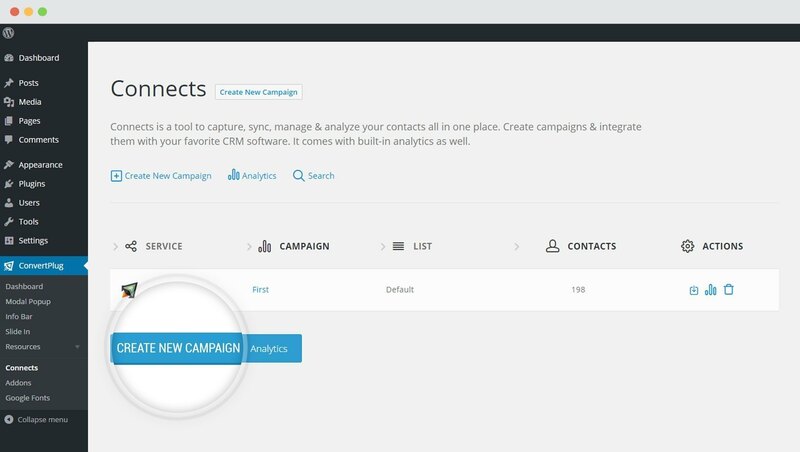 Although ConvertPlus has an inbuilt lead capture tool called Connects, it allows you to integrate with third party mailers to carry out a successful email marketing campaign. You can integrate ConvertPlus with iContact, an email marketing service provider to store and manage leads capture through the subscription forms on your website. In order to integrate ConvertPlus with iContact, you can follow the steps mentioned below. In order to learn how to use the Addon Installer in ConvertPlus, you can refer to the article here. You need to open the Connects page seen under the Resources section of ConvertPlus. 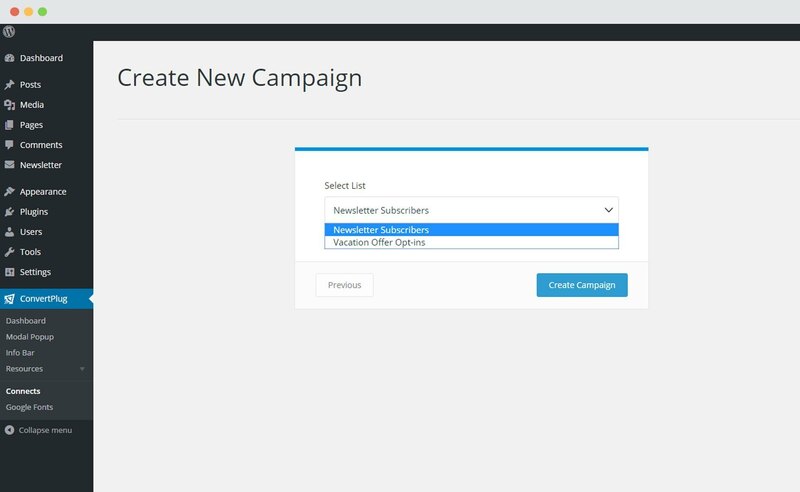 You will then find a “Create New Campaign” button that allows you to create a New Campaign. Click on it. A Campaign name should be valid, descriptive and understandable, so that you know what kind of leads are stored in it. Select iContact from the drop down below. Each email marketing software might have a different attribute that may be needed to authenticate your account. For the integration with iContact, you need the APP ID, App Username and App Password. i. You should have an existing iContact account. ii. Create at least one list that can be integrated with ConvertPlus. How to find the APP ID, APP Username and APP Password? Since we are using the trial version, we go ahead with the second link. Enter an Application Name and the Description. Copy and paste the APP ID in the Connects Interface. The APP username is the email id you used to create an account with iContact. The APP ID password is the password you just created for this particular APP ID. Click on Authenticate iContact and select the list you wish to integrate with. Click on the Create New Campaign Button. The campaign is now added to your Connects page. i. Select and customize a module according to the Campaign needs. ii. Open it in the editor. v. Save and Publish the Module. Not the solution you are looking for? Check other articles, or open a support ticket.